The Jockey Club has transferred four flat fixtures from Warwick Racecourse after a horse died at the track on Tuesday. Artful Lady fell approaching the three-furlong marker of a six-furlong handicap and had to be put down. The fixtures on 16 June and 10 July have switched to Nottingham, while those scheduled for 26 June and 2 September will take place at Carlisle. Warwick will stage its 4 July and 25 August fixtures on a realigned course. The Jockey Club, which owns the Warwick track, said it will "review our long-term options on the flat" at the course. Tuesday's seven-race card was abandoned after trainers, jockeys and course stewards inspected the home bend following Artful Lady's fall. The affected area was heavily sanded and the the next race went off 20 minutes late. However, after further consultation with jockeys, the card was abandoned. An inquiry found no turf management issues but officials admitted to a "loss of confidence" in areas of the track. 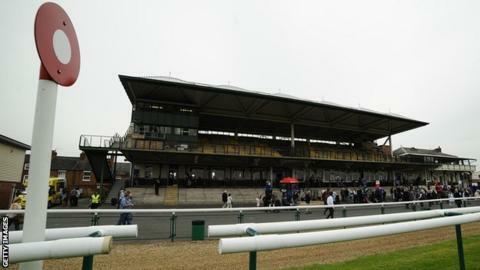 Can Warwick keep its racecourse? Read more on Can Warwick keep its racecourse?